Most of you that have spent any time in our Discord server are probably aware that I owe the community a design journal about our approach to crafting. So, here we are! We've taken a pretty deep dive into the crafting system, with a very critical eye towards what it takes to make crafting stand as a powerful, compelling experience on its own. This approach to crafting is incredibly research intensive and that takes time. But that work is done and I’m proud of what we’ve done as a team, so let’s talk about it! 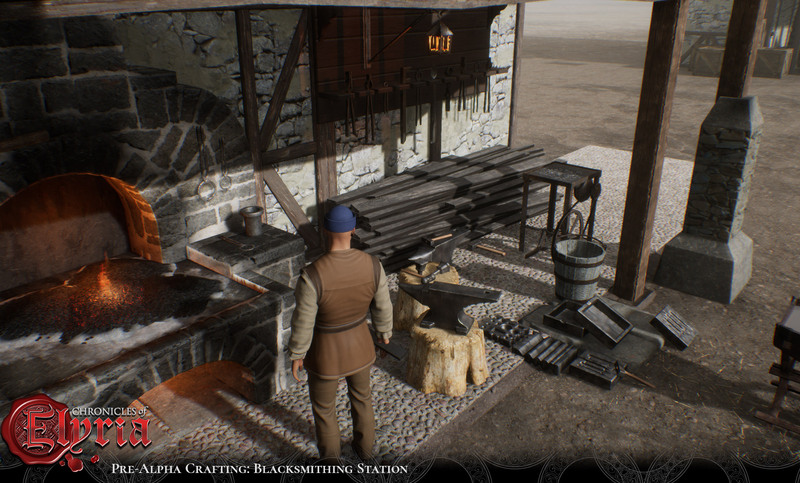 As we go through the improvements we’ve made to crafting, we’re going to primarily follow Blacksmithing. This sort of mirrors the original design journal on the topic, but it’s also a popular craft in fantasy games, so it makes sense to use it as our example. We might pull in a few examples from other crafts as well but, mostly, you’re going to hear about hot iron a lot. In our original approach to crafting, our guiding principle was to keep the game focused on both player skill and character skill. This is what led us to the “mini-game” approach of our design. It was a good design, in that it accomplished exactly what we set out to but, in doing so, it highlighted an important element that we had not addressed: Mini-games don’t feel like elements of the world; they feel apart from the rest of the world. We want experiences that capture the essence of each craft, not minigames. In fact, “Minigame” became something of a bad word for us. We didn’t exactly throw everything out and start over, but we did take a very critical look at everything that had brought us to the minigame experience and weigh their value in light of our new focus. The result is something new for us: Real-time crafting! As before, you’ll still be able to sign an apprenticeship contract with a master of your desired trade to learn from them, making it much easier to get started in a crafting profession, before you have the tools and resources you really need to grow your operation. And, as your reputation spreads and your skill grows towards mastery, you’ll find NPCs that will be willing to loan you the money to set up a shop in their area. You can likewise still join a trade school related to your chosen tradecraft and learn directly from masters who are willing to teach. None of that has changed. We’ve also kept the idea of skill challenges – specifically the core concept of skill challenges requiring an aspect of player skill to ensure success – but we’ve taken a long look at what a skill challenge is, and we’ve made some changes in that regard that I’ll explain in a moment. Overall though, crafting is still about mixing player skill and character skill and requiring both to accomplish the work. Which is to say, “It’s better to feel real than be real.” Wherever possible, we’ve done what we can to streamline and “abstract” the real-world processes we’re emulating, but we’ve been very careful to preserve the “feeling” of performing the acts in question. Smithing, for example, involves a lot of heating, hammering, and grinding. Mining involves a lot of striking and breaking rocks. But we haven’t gone so deeply into either tradecraft that you’ll require real-life experience as a blacksmith to make a knife or a degree in geology to extract iron ore from a mountain. It won’t hurt to know these things in real life though; in some cases, it might even give you a head start in deciding what to do or which tools you might need for a job. In some sense, the new crafting experience is very similar to our original take. In both systems we begin with harvesting raw materials; be that in the form of mining ore or something a little less labor intensive such as picking herbs. However, even in this first step, changes become apparent. There is no minigame for mining. Instead, you interact with the rock wall containing the vein of ore with your trusty pick-axe equipped and get to breaking rock to prise that ore out of the rock for your use. Picking herbs involves interacting with the plant, grasping the herb at the appropriate places and cutting or pulling to free your bounty from the dirt or the rest of the plant. In each case, an aspect of player skill is involved. Now, I don’t mean some “arcade” sense of the words “player skill” – I mean that, as a player, it will be on you to learn things like where to strike a vein in the rock to free the most ore, or how best to harvest the edible leaves of an otherwise toxic plant without being poisoned. The world might contain this information but, when you’re in control of your character, it’s your skill that drives their actions. We, in essence, treat your own intuition and player knowledge as the player skill involved here. Once you have raw materials, you can’t simply drop them into special slots on your character and click “craft” to build something. Those resources need to be processed to be useful. Raw materials are processed into crafting components. Iron ore can be transformed into a billet of iron or steel for use in smithing and those leaves can be dried or pressed to become alchemical components or cooking ingredients. However, doing so requires a certain amount of knowledge in the form of Techniques. Whatever your crafting focus, your trade skill will require the use of one or more different crafting techniques to accomplish anything but the most basic crafting. Techniques are learned processes, or “tricks of the trade” for lack of a better term. For example, in Blacksmithing, when it comes time to impart hardness into a blade, you quench a heated piece of metal to cool down and draw the internal structure of the metal together, making it harder, but potentially more brittle as well. Depending on what you’re making as a smith, this potential brittleness may or may not matter. But supposing it does, what do you do to try to mitigate it? To keep your blade, for example, both hard and flexible enough to block an incoming strike without snapping? Well, you have quite a few options, and each option is an example of a technique. A simple example of a technique might be to “edge quench” the blade when it comes time to quench the blade and lock in its hardness, so that you harden only the cutting edge of the blade, leaving its back soft and flexible. To do this you would use a quenching trough rather than the more typical upright quenching vessel you’d see for things like swords. You’d take your heated blade and you’d put only the edge into the trough. If you were a bit more sophisticated – if you knew a different technique – you might instead apply clay to the back of the blade when heating the weapon for quenching so that it doesn’t heat up at the same rate as the edge. In either case, whether you clay the blade or just edge quench it, you’d create a blade that had a softer spine than cutting edge, making the blade more resilient and less likely to snap or shatter. However, each of the methods have their own risks and impart different properties to the blade being quenched. Techniques are both the way a crafter advances their knowledge of a craft and the way that you can impart your own unique style to your work as a crafter. Many techniques are interchangeable within crafting recipes, allowing you to substitute one technique for another and still produce the item in question. It might be that you’re the master of the edge quench and so you never bother to learn the technique of applying clay to your blade. It might be that you know both techniques but prefer one over the other for the properties it passes on to the finished work. Why you use one technique over another is up to you. As I hinted at in the previous paragraph, techniques aren’t just processes you can apply in the crafting experience, they’re knowledge that must be learned. So, in some way, techniques also act as progress gates. It might be that a work product requires a specific technique. For example, to make most pattern-welded billets as a blacksmith you need to know how to forge weld. It might also be the case, however, that a technique isn’t required for a specific work product but is required to impart a property to a finished work. A smith might add a fuller to the blade to add the “lightened” property to the weapon, reducing its overall weight, for example. In a small way, these properties take the place of stat bonuses given to you by gear in traditional MMOs. Properties can change the way a weapon or armor performs in combat, or alter the effect of eating food or drinking potions and other beverages. Techniques can be interchanged when they produce the same result. So for example, you might know several techniques for smelting iron ore into various grades of iron, such as for making steel. Which techniques you use as you complete a recipe will also change which properties are imparted to the resulting item. A smart craftsperson will want to learn as many techniques as they can, because their use is one way for the work to have its own identity and "speak for itself." A smith might use a particular set of techniques to create signature weapons, a baker may know the way to bake chocolate chip cookies that taste like home. Their secret is as likely to be a matter of which techniques they use as it is which ingredients were used. The techniques are performed the way they are in real life. OK, OK, the techniques are performed in a manner that’s really close to the way they’re performed in real life. In fact, why don’t we walk through crafting a sword from ore to finished product? When we left off to discuss techniques, we were holding some iron ore in our hands, weren’t we? So, let’s pick up from there: We need to process this ore into iron that we can use to smith with. One way to do this is to heat the ore in the forge until it becomes spongy and then take it to the anvil and hammer it to drive out impurities (“the bloom”). In real history you would use a special furnace called a bloomery for this, but we abstract some of those details out to make things easier without sacrificing the overall feel of the method involved. So, we have our ore in hand, we head over to our forge and we realize the forge is not lit. That’s OK, not a problem, we can discipline the apprentice later. We’ll just put the ore down, take some coal from our stockpile in hand and carry it over to the forge and put it down, adding it to the forge’s reserve of coal fuel. Once we’ve got coal in the forge we can light the coal using a tinder box and flint kept near the forge and work the bellows to get enough air on it to get the coals going. Had our apprentice been on top of things, the forge would have been hot and ready for us but, as usual, he’s nowhere to be found. So, we’re going to have to do this solo, as they say. The forge is hot now, so we disengage from the bellows arm, pick up our ore, and head back to the forge and put the ore down on the shelf next to the forge to create a pile of ore laden rocks. If we had the knowledge and the tools handy, we could grind the rock and separate out the lighter stone, but that’s an advanced technique and we have no associated recipe memorized or in our journal, so we can’t really go that route. Instead we’ll do this bloomery style, which is just a fancy way of saying we’re going to heat the rock up and beat the impurities out of it until there’s nothing left but iron. To do this we’ll open our journal and find the bloom refining recipe, then interact with our forge with the recipe open to let CoE know that’s what we’re doing. After that, all that’s left is to physically perform each step of the recipe. So, we start by taking the biggest stone from the pile and we add it to the bed of coals using a pair of tongs we keep near the forge for this purpose. When you add an item to the forge while the coals are firing, you’re placing the object within one of several heating zones within the forge, though you won’t see them as an element of your UI or anything. The coals in the forge will tell you which are hottest by their color, the way the air shimmers above them, the sound of their burning, and any visible flame they emit. The point here is that where you put your object in the forge matters. In this basic smelting technique we’re using, it doesn’t matter too much but, when you’re heating your steel it’s possible to make the steel unhardenable and essentially worthless if you’re not careful with it in the forge. These heating zones help us to calculate and simulate such risks. But for now, what we’re looking for is for the ore to transform into its spongy state, so we can start to hammer the sh- stuff out of it on the nearby anvil. As we see the ore begin to change shape it morphs its shape slightly and its visual representation changes, as does the sound it makes in the fire. If we consult what we’ve learned about our technique via its recipe, we would know these cues mean it's ready. Using the tongs, we can pick up the hot spongy rock in the coals, disengage from the forge, and move over to the anvil. Picking up a hammer in our other hand on the way, we click on the anvil with either the tongs or the hammer and the camera is positioned over the anvil to show us the anvil and our tools. If we move the mouse, we position the hammer on the anvil, if we click with its tool button we’ll strike with the hammer, driving out a bloom of useless material and hot dust. With each hit we do a little more, the object slowly morphing into a small nugget of wrought iron. However, all of this takes time, and the moment that rock leaves the forge it starts to cool, so we have a limited time to strike at it with the hammer until we need to heat again. Hit the rock while it’s too cold and it could crack and crumble, leaving us with rocks too small for this process to smelt. We can do this with each of the rocks in our smithy, leaving us with a pile of wrought iron nuggets we can then pound together into an iron bar using a technique called forge welding, or we could put them in a crucible or canister and melt them into the form of a bar. It would really depend on what techniques and recipes our character knows. Once we have an iron bar we can likewise convert it into steel using a few different techniques. One method is to take the wrought iron and some pig iron or other high-carbon steel and slowly mix them together (“confuse them”) in a crucible so that the wrought iron takes up the carbon and turns into steel which, for this narrative, we’ll use now. It’s essentially about getting the mix right and letting the metal melt in the crucible at this point. However, with literally every crafting process, there’s a chance that something could go wrong. We call these “crafting challenges” and they are more likely to happen when the recipe you are attempting is difficult for your character, based on your character’s skill level. The more difficult the recipe – the wider the gap between your character’s skill level and the recipe’s difficulty – the more likely you are to see crafting challenges, but don’t worry: a crafting challenge is something that you can usually resolve with player skill. For example, as we place our crucible in the forge, ash from the coals might foul an airway and threaten the ability of the coals to stay hot. If we do nothing, the crucible won’t get hot enough to confuse the two metals inside but, as a player who notices this has happened, all we really need to do is rake the coals and allow air to pass through the coals cleanly again. Once we have our crucible of molten steel we’ll want to make a billet out of it, so we’ll pour the molten steel into a mold and let it cool enough to solidify. At that point we can break it out of its mold, get it into a pair of tongs, and get back to work. Now, like most craftable objects, swords are componential. They’re made of a blade, a pommel, a guard, and some sort of handle/grip material. We’ll make a classic Neran longblade which calls for a double-edged blade with a fuller, a simple metal cross guard, a wrapped handle, and a metal pommel. Scrounging around our smithy, we realize we already have a steel cross guard, a brass pommel, and some silver wire we can use as the handle wrap, so all we really need to make is the blade. To do that we find the double-edged blade recipe in our journal, open it up, and step up to the forge. We need to wait for the steel bar we’re heating to get white-hot, so we pick it up in the tongs and move it to what we feel is the hottest part of the fire, all the while watching its color and listening to the sounds coming from the forge. 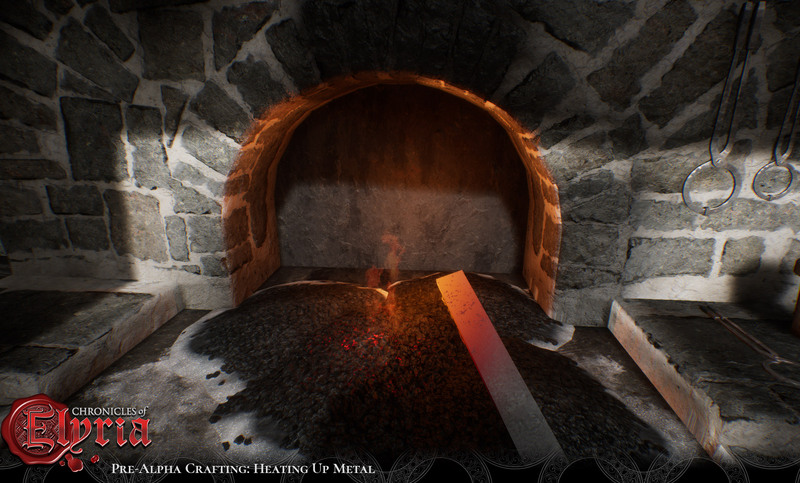 When the metal is hot enough, the color will change to a bright yellow-white and the tone of the fire in the forge will change so that, if we’re paying attention as players, we’ll have the cues we need to know the metal is ready without any HUD elements from the UI or progress bars filling up our screen. Knowing when the time is right is a piece of the player skill element of crafting. Now, there is one sort of game-like element to this idea of having little or no UI for your crafting work. Each of the crafting stations and techniques that you use have "tells" like the color of the metal as it's heated, or the sound it makes in the fire. In real life, there's usually only one "tell," if any, and real craftspeople learn their own indicators for when the time is right to do something. However, in a game your senses are limited, and even as a player you may have challenges that make seeing these tells difficult. Because of this, there is almost always two tells for perfect timing when you perform each technique, one is visual, the other auditory. This way you can decide for yourself which indicator works best for your circumstances. Once we’re ready, we take up the tongs again and pick up the billet, leaving the forge to take the billet to the anvil. As we engage the anvil, we’re shown the close-up view again. If we hold down the button for the hand holding our tongs, we can position the billet on the anvil as we move our mouse. Letting go of the button will “lock” the item there. Now we need a hammer, so we pull a hammer from our inventory into our other hand, making it visible in the anvil view. Like the tongs we can position the hammer by moving the mouse, though with the hammer in our hand, we do not need to hold down that hand's use button to do so. Instead we use that hand's button to strike where the hammer is positioned. Where we hammer on the billet matters. We’re trying to draw out the shape of the longblade and, every time we strike the billet while it’s hot, we spread the metal out at the point of impact. How far the metal spreads depends on the hammer, your character’s strength, and the temperature of the metal. As you strike with the hammer, the game analyzes the impact point and determines if the strike was helpful or not. If the strike was helpful, the metal will move slightly more in the direction of the proper shape. If the strike was not helpful, however, the metal will move closer to a misshaped piece of useless junk. So, knowing where to strike matters. And of course, the metal is cooling every moment it's out of the forge fire, so you only have a limited time with the hammer before you have to put the metal back into the forge to heat it back up. This makes forging the blade a sort of back and forth loop between the two crafting stations; starting at the forge to heat the billet up, then taking the billet to the anvil and setting to work. This back and forth continues until the blade is approximately the correct shape or something happens to ruin the blade. 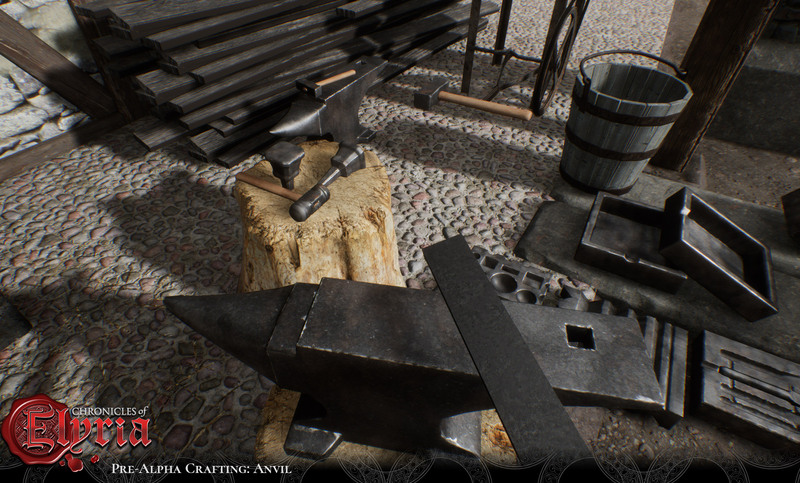 Anvil crafting challenges can be as simple as losing your grip with the tongs – sending hot metal to the smithy floor – or they can be serious problems that introduce flaws into your blade if they are not resolved. For example, attempting to work the metal while it’s too cold might result in the metal cracking, or you might work all the carbon out of the blade if you take too long forging it, making it unhardenable and essentially worthless. And the chance for problems grows as more advanced techniques are applied to the weapon. A Neran longblade is a fullered weapon, which means that, in addition to forging out the rough shape of the blade, we need to work a fuller down the centerline of the blade using our fullering tools. To do this we pick up our fullering block and attach it to the anvil’s hardy hole. Then when we pull our blade out of the forge, we place it between the striking elements of the fullering tool, and strike the fullering tool with the hammer. However, any number of crafting challenges could arise out of this scenario depending on our character’s skill. We could make the fuller too deep or too shallow which imparts undesirable qualities to the blade or we could deform the blade accidentally and introduce a warp we’ll have to correct. We could even break the fullering tool itself, depending on its condition. But, if we succeed, what we have is a sword blank for a longblade. A workable piece of steel we can then quench to harden. To quench the blade, we take it back to the forge and we heat it up. If we’re tricky about it, we might thermocycle the blade, heating the blade up and then letting it cool and repeating the process several times to normalize the steel and make it less likely to deform as it cools. But once we’re ready to quench, we need to get the blade good and hot without overheating it and driving out the carbon that give the blade its resilience. Once we’re happy with its heat-color, we take the blade in tongs, exit the forge, and approach the quenching vessel. We’ll use the vertical quenching vessel, a barrel filled with an oil we acquired just for this purpose. As we interact with the vessel, we see an overhead view of the barrel with our sword blade and tongs above it. We can position the blade with the mouse and then press the button that corresponds to the hand holding our tongs to submerge the blade in the oil, holding the button down for the duration we keep the blade submerged, only releasing the button when it's time to remove the blade from the oil. The whole time the blade is submerged, the oil will hiss and smoke. If we’re lucky the blade will be mostly silent, but we might hear a ting or a whistle or worse, a pop or crack, which would indicate that something happened in the quench which will negatively affect the blade. We won’t know what the problem is when that happens until we remove the blade and inspect it, though the most common hazard at this stage is the blade warping, which can, in theory, be fixed using an anvil tool called the bending forks. Let’s assume that things went well for us here though, and our hardened long blade emerges from the oil in perfect condition. All that’s really left is to clean the blade up and grind the edges into either side of the blade. For that we need the grinding wheel. So, we take the blade in one hand and we approach the grinding wheel, interacting with it to show us the detailed view of this crafting station. Now we can position the blade with the mouse and click the associated hand's button to press the blade against the wheel. The wheel must be spun, which we can do by interacting with its treadle, spinning the wheel with our feet. Here things can get a little tricky. It’s possible to apply an edge irregularly if we’re not careful, or to overgrind parts of the blade so that it gains some negative properties or loses some quality. Likewise, we need to pay attention to how we’re using the wheel so that we don’t forget to lubricate the wheel with water or oil as needed to prevent it from overheating or grabbing the blade and literally yanking it from our hands to go flying across the smithy. But, dangers of crafting challenges aside, the process for grinding our blade is straightforward, we “plane” the blade across the wheel as we press it against the grinding surface. This removes material from the blade and, if we do it right, imparts an edge at the same time. When we’re done, we’ll have finished the work of transforming some basic iron into a steel blade ready to be assembled into a Neran longblade. Assembly can be done just about anywhere. You can do it in the field and you can disassemble a sword in the field as well. To assemble a sword, you simply use your crafting skill on the blade, select the recipe you’re assembling, and then select each of the components used in final assembly from your inventory, one by one, starting with the guard, then the hilt, and finally the pommel. The recipe might require you use tools (such as a hammer or glue) at this stage, but many weapons are pressure fit and require nothing but your character’s physical strength for final assembly. And when that final assembly is done, we’re left with a Neran Longblade we built ourselves, with all our triumphs and defeats literally hammered into it. Inspecting the weapon will reveal its properties, allowing us to see exactly what we’ve wrought. But the inclusion of both player skill and character skill, in the form of crafting challenges combines with the pairing of player and character knowledge in the form of techniques, recipes, and real-time in-world cues to turn that simple framework into an immersive real-time crafting experience that gets rid of the worst elements of crafting we are so used to seeing in traditional MMOs. This level of detail and attention is necessary to create the evolving world of Elyria. 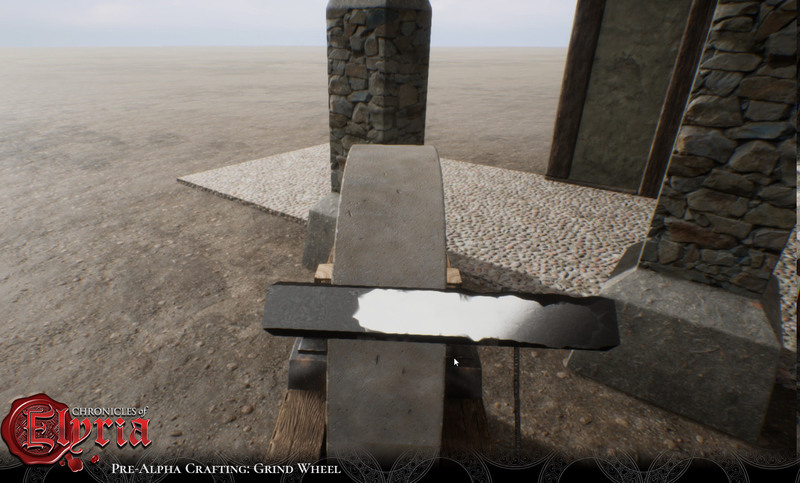 Every object – from foodstuff to siege engines – can be crafted in Chronicles of Elyria but the process of taking raw materials and turning them into those objects is hard and labor intensive. You can't really do it alone without making it your soul's endeavor. 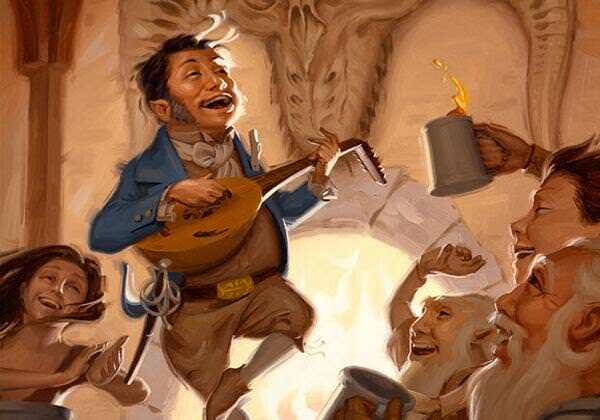 Instead, it's easier to share the work: The miner mines and smelts, the bladesmith turns steel ingots into blades, and the whitesmith or the jeweler turns silver wire into an ornate handle. Together they can produce masterpieces daily. In Elyria, crafting isn’t something you do quickly while you adventure. True mastery will take effort and each of our trades is a career path that fuels the beating heart of the world's economy. @Malais, If you wanted to be a weapon smith couldn't you just specialize in the blade aspects of blacksmithing and the hilt aspects of woodworking. I think the problem of needing different people for different components only arises when you want to be broad in your character. For example, If I wanted to be a blacksmith that makes tools, armor AND weapons then yeah, I probably would need to find a woodworker for hilts. Therein lies my question. To this point we haven’t had any real hints as to the level of detail or difficulty in crafting components for each end use item other than the blanket statement of crafters needing to collaborate. It would be nice to have at least a general idea of how Snipehunter and Co. want crafting to feel and what their backup plans to account for human interference in the system. Quality of components matters. Sure, as a blacksmith I am sure you could learn to create a basic handle for something. Carving out a couple of flat pieces of wood or a circle of wood with a hole in it isn't hard. But if you want high quality handles that fit well in your hand or are decorated with inlay or carvings you're going to go to a wood carver. The intention is to create an interdependent web of crafts, moreso than it is to force you to require other people. My take, personally, is that if you want to try your hand at being the one-man crafting-crew, more power to you. However, what you will find in the attempt is an intensity of labor. Nothing in our systems says you can't master bladesmithing and push your woodworking and general metalworking high enough to produce good guards, blades, hilts, and pommels, for example. On the other hand, the time it takes to produce all of these, as well as the various pins, adhesives, and other fixtures means that you're going to be spending a while to produce a single sword. Just forging the blade may take a few minutes, but that's compounded in nearly equal allotments for the major elements of the weapons and all of the minor materials that are part of the process also take, collectively, a few minutes to make as well. Assuming the weapon is a challenge for you to make, we could be talking about an Elyrian day of work. Even as a master it will still probably take you 20-30 real-time minutes from scratch, factor in travel time between the various stations. It could very well be that your product's quality and the particular properties you impart as part of your use of techniques make that effort worth it - people could very well seek out your weapons. But if you're not as well known, and the blacksmith next door can knock out a decent sword in 1/5th the time because all she has to do is forge the blade from an existing billet and assemble the pieces she picked up at the market, that quality -- and that labor -- that you invested might go to waste. You may not be competitive. Which is actually much closer to the point. Our goals here are to support the connected economy while leaving the tactical choices of plying your trade up to you. There's a demand for everything every trade can produce, which will support a wide network of tradesfolk across a broad spectrum of skills in the pursuit of their own economic niches, but which niches you pursue and your strategy for doing so is up to you. As for how we want it to feel? We want you to feel like you've accomplished something when you successfully craft something. Crafting isn't a side-gig every player does. That's not our goal. The system certainly supports hobby work, but you can't expect it to make you money because the game is populated by people who are "serious" - career tradesfolks who dedicate the entirety of their skill growth and available time to the endeavor. (Both NPCs and players, for that matter) Crafting a sword isn't the same as taking out a trash mob in a traditional MMO, it's bigger than that. It's more akin to a floor boss in a JRPG in terms of scale. Barring some rare exceptions, such as stepping into the young heir of a smith, you won't be forging swords on day one. Though, if you had a recipe and knew the techniques, you technically could try. Jesus. Well RIP bot makers. I like this crafting system, though I might not later when I need to buy a weapon and they are all expensive as hell. But that opens opportunities to have stuff like family weapons that are passed down because it's cheaper than making a new sword or because the quality of the blade turned out uniquely good. Not everyone will enjoy or have the skill for crafting, which gives value to the dedicated crafters out there. Scarcity could be a real thing in CoE, which is an amazing concept. I am just used to collecting a thousand swords off random enemies. Looting weapons off dead players could be very profitable, but at the same time very risky, as blades can be pretty unique and recognizable. I hope NPCs with full weapons won't be too common, and that the weapons they use can't compare to the ones players can make, OR that NPCs have to buy their weapons the same as regular players. I think it would be amazing to see NPCs come check out my shop and buy some things that they need. Otherwise, there will be a lot more generated weapons on the market rather than custom weapons, and it will probably ruin the economy. Why spend hours crafting when you can kill bandits and sell their generated gear? I don't understand why people think it would be anywhere near difficult to create a bot for that system? Could you elaborate your way of thought here? If anything bots excel at a system like this? In regards to "botting", aren't they actually encouraging you to do so (and pointed out that it is possible) with the OPC system? From what I understand, they fully expect you to use the OPC system to craft "easier" things. In short how will the system compensate for a region or perhaps an entire kingdom in which there are thousands of swordsmiths but no one who can make hilts? My MMO sense tells me cross skills would be the answer. Perhaps a woodworker who specializes in bows could use their skill to make a wooden hilt for the local blacksmith. Is the system really as interconnected as to allow 3-4 end use crafters to be able to trade lower tier components between them allowing for each to have access to the raw components they each need? That is absolutely the intent. Most handles, for example, aren't made of metal. They're leather, or wood, or some mixture of the two. A leatherworker making, for example, belts still needs metal fixtures (rivets, buckles, etc.) from a metal worker. A fletcher needs metal arrowheads, and so on. Of course, making those components usually isn't the be all end all of the related skillset, so it's also possible to learn how to do them yourself, but that will take time and effort, so it becomes a strategic choice as much as it is a requirement of the end product. It's the way challenges work in the crafting experience, I think. The thought, I believe, is that most bots are follow a rote procedure and so couldn't react to the changing nature of crafting. You are, in essence, left with having to build an AI driven character that can play this particular game. And that might even discourage some bot-users, but building AI to play games has been a part of this line of work for longer than I've been a game designer, so I agree that it's not impossible or anything. It will discourage the game equivalent of script kiddies, but we didn't set out to make a bot-proof mechanic here. We set out to make a crafting system that supported the economic systems we're building and one that feels right. Bots we're dealing with in other ways. In a way there will already be bots for the crafting system, built by SbS. Granted they have a bit of a different access level to all the underlying things, but technically all the NPC's are just bots. TBH I'm a little disappointed by the whole recipes thing. I get it that it's kinda necessary for a balanced system, but I was really hoping for a system with more freedom. There doesn't seem to be any opportunity to innovate here--other than maybe small stat changes within the original recipe. But what if I want to make a slightly thinner blade than normal, or a longer one, or one with a forward curve or a different balance... Being able to personally shape the blade and infuse my own creativity into it, rather than just banging on it till it fits the template, is the dream for me. There are definitely limitations in the system necessary to enforce certain aspects of the world mechanically, but that said, you may have more freedom here than you realize. While, yes. it's true that you have to use a recipe - components are interchangeable as long as they are of equivalent "component classes." A recipe for a rapier might require a thin blade, a guard, a handle, and a pommel, but it will allow you to use any thin blade, guard, handle, and pommel. Further, the techniques you use when crafting each component will play into how it looks. Adding a fuller to a blade will literally add a fuller to the blade's model in the game, for example. Decide to build that blade out of ladder Damascus and the metal will have that pattern on the blade, in game. You are restricted, there's no good way around that for what we're trying to do here, I'm afraid, but you also have far more freedom than the crafting systems available in most, if not all, of the MMOs on the market today. (...)In regards to "botting", aren't they actually encouraging you to do so (...) with the OPC system (...) to craft "easier" things. Yes and no. I wasn't talking about an OPC, but about a bot that listens to the data-stream and then scores a next to perfect (with a bit of randomness to avoid detection) results on the skill test and the challenge, hence producing master piece products en mass and leveling up your skill at the same time. That's kind of an entire different level from having an OPC do some low level crafting. (...)but we didn't set out to make a bot-proof mechanic here. (...)Bots we're dealing with in other ways. Yes, it does help, though I confess I'd be really curious as to how you intend to deal with bots. Since by designing the system in the way you did, you provide quite a large incentive for people to use them.